When you pack loads of veggies, beans and meats into one big pot of simmering chili, you have a quick dinner for several meals. 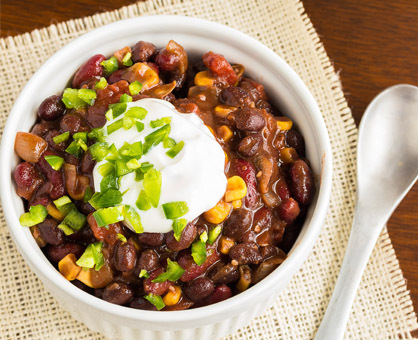 These hearty, tasty go-togethers will jazz up your chili routine. Shredded, lightly fried corn tortillas, crumbled corn chips or lightly toasted pitas cut into strips can add crunch and flavor. Make chili the topping by layering it over grains such as rice. Use brown rice for a healthier option. A traditional chili topping is sour cream, but for something lighter, try plain Greek yogurt for the same creamy addition with less fat. Try sliced green onions, finely diced tomatoes, sliced radishes or pitted, chopped black olives. Different colored chopped bell pepper is one option if you want to brighten up your chili. Or, you can add sliced avocado or guacamole. Cheddar, Cheddar Jack and colby Jack are often used to top a bowl of chili. For a fun variation, top with pepper Jack or Swiss cheese instead.